Déménagement en provenance/direction de Houston TX 77003? Obtenez GRATUITEMENT des estimations de tarif pour la location de camion au Harrisburg Corner Store. Les camions de location U-Haul sont spécifiquement conçus pour déménager des familles et non pour transporter des marchandises. Nos camions de déménagement possèdent plus de particularités de sécurité que tous les autres camions de déménagement de l'industrie, incluant une suspension pour un roulement en douceur et des rétroviseurs offrant une grande visibilité afin d'aider le conducteur. Que vous déménagiez d'un petit appartement ou d'une grande maison, le service de location de camions U-Haul à Houston, TX vous offrira la location de camion de déménagement dont vous avez besoin pour vous rendre du point A au point B. Trouvez le camion de déménagement de la taille parfaite pour vous aider à déménager chez U-Haul, qui offre la location de camion à 19,95 $! Les fourgonnettes et camionnettes de location U-Haul de Houston, TX sont idéales pour les projets d'amélioration domiciliaire, les livraisons et d'autres petits chargements. Louez une fourgonnette ou une camionnette pour économiser lors d'un déménagement ou de livraisons de courte distance. La location de fourgonnettes et de camionnettes est très populaire auprès des entreprises locales et des étudiants, comme pour les petits déménagements résidentiels à Houston TX 77003. Nos fourgonnettes de déménagement en location sont équipées de la climatisation, de barres de protection pour protéger vos biens et d'une attache pour remorque de location. 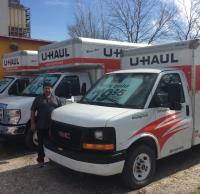 U-Haul offre des fourgonnettes de location à 19,95 $ à Houston, TX; réservez une fourgonnette pour votre déménagement chez Harrisburg Corner Store! Owner is very rude & combative to patrons. The site is not well maintained. Nobody should rent from here. Terrible experience in general with picking up the uhaul - originally we were supposed to pick up via mobile app at a different location and had to extend the time a bit but no one on the phone at uhaul told us that we couldn’t pick up the uhaul via app after a certain time. We were then redirected to the Harrisburg location after we reached the original pick up site, and that was also a disaster. The system was apparently slow/down and it took a long time before we found someone to talk to on the phone that told us we’d have to rent the uhaul on our phone since they couldn’t access reservations on their system there. I rented from the Harrisburg corner store. The first truck we tried to rent had a flat tire, took over an hour to change trucks. Everything was fine on that truck. Returned the truck with a completely full tank and yet this place charged me 37.80 for ez fuel. Will complain on every single social media platform I and my friends have access to. Worst possible location to pick up a truck. A gas station with only one employee who had to handle people buying gas, smokes, beer, etc, as he was checking me out. Took forever. We had ordered and it was confirmed by the reservation system that I could pick up 24 furniture pads. Showed up to get the truck and they only had 11. So I had to pack my stuff without proper padding. Some stuff ended up scratched because I did have enough padding. The place I selected thru your reservation system to pick up the truck was a U-Haul store that would have had everything I needed to take the stress out of moving and the parking lot would have been paved. Unbelievable that you sent me to this location. Absolute the worst possible place to pick up a truck and they had no supplies. Why would you send anyone to a location like that? It screwed up my entire move. Thanks for making it more stress than it needed to be. Unbelievable!!! This place is terrifying. I was so scared to walk in. It was difficult to park, there were homeless people everywhere, and when I walked in there was a man screaming at the guy behind the counter. The representative was very nice, but I do not feel safe at this place and I’m glad I only had to drop off the truck here. I would never use this location in the future. My blll is incorrect, i was overcharged 30 dollars, and there is no line item specifying why!!!! Employees were not that professional and do not know the meaning of customer service. The person checking in stopped processing me and went outside and had a conversation with a non-customer. The equipment looked questionable. One front tire seemed larger than the other. The front cab was dirty with soda stains and a cologne bottle was in the glove compartment. A random snack cup was wedged between the front window and the dashboard. I left it as is and was somehow charged a 25 dollar cleaning fee. The rear cab was dirty too when picked up. I would not recommend this location. The cashier was kind and helpful. But the owner's faulty computer set us back 45 minutes from checking out as it rebooted on its own. Owner was not present to help. If referred to this location again, I would ask for another location to pick up a truck from. Period. Great folks gas here is also quite reasonable so super convenient!!! This location was honestly very scary and I was afraid to leave the vehicle here. The personnel running this location were very rude on the phone and difficult to communicate with and contact. I honestly was nervous I was going to get robbed or hurt at this location. I would highly not recommend this location to anyone. First, I was not happy that I reserved the vehicle at a location down the street but ended up having to drive to this location. The system should not allow reservations at locations that do not have the requested equipment. When I called the Uhaul phone number, the customer service rep was immediately sassy and unhelpful. The Harrisburg location that I was redirected to was a rundown gas station. The person "helping" could barely handle checking out customers much less getting me the Uhaul. She completely forgot that I was outside in the cold when she was supposed to be getting the keys to move another vehicle that was blocking me from getting out. The parking lot where the truck was kept was littered with bottles and trash. I did not feel safe while i waited. It took over 30 minutes for me to get the vehicle. Very bad experience picking up. When the GPS stated 'you are at your destination', we had no clue. The place was dark and the signage was poor. There were no other U-Haul it trucks. We were uncomfortable and the area appeared dangerous. Just happy to get back into our cars and get out of there. Sorry, maybe during the day it would have been ok. But at 9:30 and pitch dark, the drop off stop was very uninviting. The owner was very rude and unprofessional, and arrived to the location 1 hour and 40 minutes later than when my truck was guaranteed. The area is not safe. The truck was dirty and I needed to clean it out before loading my boxes. This location should not be associated with U-Haul. Worst experience I've ever had moving. The locator used by Haul said this location was close to where we were, but it was about 10 miles (and 45 minutes in Houston traffic) away. The drop-off location was in a very run-down part of town and I did not feel very safe. Thankfully it was daylight when I visited. I was a little confused at first since it's a corner store or gas station BUT.... the guy that was there was really nice!!! I was. Very happy with his customer service. One thing that would be a better is a ramp in all trucks. Other than that, everything was great!! Took over 2 hours to get a truck. My reserved truck was there but told it was being held for someone else. Told the system wasn't letting them give me truck.person there not a good grasp of English. Employee couldn't find the truck keys. Told me there was no after hr drop box and there was. Had to call the reservation office .Devin was a miracle worker. She had to do everything from her location because the guy was clueless. Had a homeless man sleeping in back of truck I finally got. Returned truck around 9:30 sat night. Truck was not checked in and is still not checked in at 6:30 pm. Sunday. Milage out was 38264.0 mileage at return 38287.6. Devin deserved a reward for helping to deal with this location. It was extremely frustrating. Please credit my charge acct and send me a receipt to my email. I will never deal with that location .would give it a lower than poor rating if that was an option. Was not given a correct copy at turn in with correct mileage. Had to go back at 630pm Sunday and take picture of the mileage. Didn't trust them to report mileage correctly when they finally decide to process the return. Devin ended up giving me a larger truck for the price of the truck I originally reserved. We only had the truck less than 3 hours. Is there any other credits I can receive for the extremely bad service at this location. The man yesterday didn't even want us to return the truck to their location but somewhere else. He kept making us wait while he waited on his gas station and convenience store customers. U haul and their rental customers are not a priority at this location. We were treated like we were a bother. There was only 1 man trying to run gas station and convenience store and the u haul business. Just a very bad experience except for Devin. Barely noticed the small u haul sign. Easy to pass by and then get lost. It's not in a very safe neighborhood. The attendant was very attentive and courteous. I don't think I will use UHaul again. Each time I have booked, I book at a location convenient and safe. But then UHaul sends me off to some other location neither convenient nor safe. Each time I end up in a neighborhood I would never otherwise venture into. Each time the locations were very disorganized as they waited on customers that were there for their primary business, UHaul just being a side business for them. No more. I'm out. Penske for me next time.